This is the photo light box I came up with. Not a new project on Lumberjocks but this is my take on it. My wife takes great photos and of my projects on here if it looks nice its hers if not I am sure I took them. We use a good camera its a Sony Nex 5. But we always end up with photo burn on the small shiny stuff. This is our fix for that. So out come the magnets (see pics 2 & 3)! And the wood scraps!!! Cut some scrap wood to size and started making the frames for the fabric. Leaving some space for the magnets to be glued in. Built the bottom out of some scrap particle board. Drilled in the magnets flush and glued in place. Used 2 sided tape to attach the fabric to the frames. Same tape I use on my lathe. Good stuff!!! After I had the sides and back built I was presented with a slight problem. How to keep the top corners tight together? I didn’t see this coming so I didn’t have a plan. After trying a few different things to hold it in place. The best one I came up with is shown in pic #4. I am using electrical line staples drilled into the edges of the wood frame. I just made the same holes in the fabric after that was attached and it holds together great! Now what to do with the inside bottom surface. Ya put fabric on it. But what if it gets dirty. No don’t do fabric use white drafting paper. Then if it gets dirty just put in a new piece plus it makes it easy to change colors if needed. Assembled size is 18” x 18” x 18”. The overall size when storing this is 2” tall x 18” x 18” = to me nice and small!!! I have a great friend here on Lumberjocks that has provided me with some great tips on how to take better pics. So a big thanks goes to Brett!!! See the last pic. To me its a 1000% better then what we were getting before. I used $10.00 lights from IKEA to light it up. Total cost was some time and about $40.00 to make this. I would like to know the good and the bad of what you all think! Do you have any ideas on how I might be able to improve this setup? Please let me know!!! One of my priorities in the new shop will be an area for photography. Great. This time i need to make one. Nice project, clever use of materials and a very nice picture. For some reason it reminds me of a kite. Please consider that parallel a compliment. Good job. I look forward to seeing some good pics. Nice work James! Now you don’t have to run to the bathroom everytime you need to take a picture! ;) ha ha. 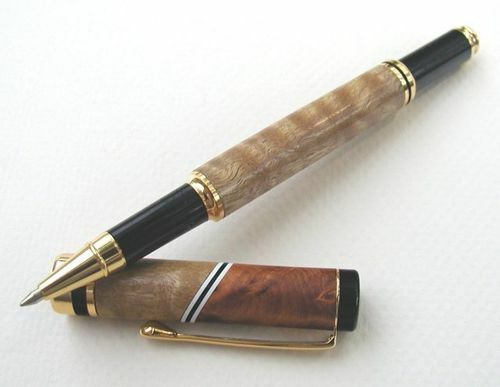 The picture of the pen looks great. It is definately a good representation of the piece. Nice photo lighting idea, I bet it works well. Not trying to hijack your thread, but a good alternative is to go to the local Goodwill and give them a couple of bucks for a large white lampshade. put your pen on your cloth/paper, put lampshade around it and put lights as needed around the outside. The shade works like a reverse filter and you can shoot through the top. Works very well on pens and other smaller items. The tough part besides eliminating the glare is to be rid of the shadows. A soft bounce from the front should do it. Great idea. Some magnets recessed into the top corners should help them stay tight together and allow easy assembly and disassembly as well. You can get quite small rare earth magnets that still have good holding power. HF has cheap 3/4” rare earth magnets if you have that much room on the one side, then a smaller one on the narrow edge should work.